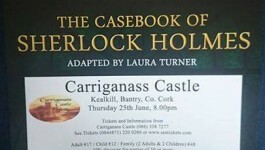 The Carriganass Development Association manages the castle on behalf of the wider community. If you’d like access to the castle site outside of the regular opening hours, we’ll do our best to accommodate you. We can arrange access for large walking groups, and we can also provide a guide for historical tours of Carriganass. We have opened the courtyard to accommodate wedding photo shoots too, as the castle is on the road to the beautiful church at Gougane Barra. If you’d like to get in touch, please contact us by ringing Mick Cremin on 086 238 5611, emailing info@carriganasscastle.com or by using the form below. Entrance to the castle is free of charge. If you'd like to make a donation towards the upkeep and ongoing renovations of Carriganass Castle, you can send donations to Carriganass Castle Ltd., Carriganass, Kealkill, Co. Cork, Ireland.